This week, I'm still crunching away on my larksfoot blanket, which I've decided to name Hensfoot, in honor of my chicken girlies. I'm enjoying this blanket very much. I'm going to have to put it aside before long to get started on some holiday-gift crocheting, which will be fun too, so I'm savoring this work and still trying to pace myself because it's just so pleasant. I'm smitten. I finished Me Before You, the Jojo Moyes novel I was reading last week. I really liked it. It wasn't perfect; I think the writing is a little...lightweight? I don't know. The story seemed somewhat simplistic for the serious issues being discussed, but I enjoyed it. I hear they're making a movie! That should be interesting. I looked up the Wikipedia article for the movie and the only actor I recognize is Brendan Coyle, who plays Bates on Downton Abbey. This week, I'm reading The Family Romanov, by Candace Fleming. I've discussed my long-held obsession with this subject before. This book is new to me, though. It's actually written for young adults and is a simpler version of the story of the fall of imperial Russia. It's well-written and really quite gripping in its details and has a lot of photographs I've never seen elsewhere. I want to find some of the author's other YA histories now, particularly her books about the Lincolns and Amelia Earhart. I've always been sort of a closet reader of YA books, due in part to the fact that I used to teach high school English. I like to keep up on what those whippersnappers are reading nowadays (and store ideas away for when my kids will be ready for books at this level). Hey, I'm sorry if I haven't been visiting your blogs much lately. I'm having some problems with my blog feeds. I'm also feeling kind of blah lately; it's nothing serious, just some mood-related ups and downs, feeling a little anxious. Sometimes it just doesn't come easy, you know? I'm okay, working hard (oh so very, very hard, trying to keep up with these two little brainiacs and all their learning and making and doing). I'll be back soon, my peas and carrots. Hensfoot is a wonderful name for your blanket, I love it. dear. Give yourself a little extra love and enjoy the day. I love your blanket - the colours are gorgeous. Me too - I admit to loving YA fiction, particularly historical fiction. And I love Russia and the Romanovs - this is a great book. Hope you stop feeling 'blah' soon. But we all have seasons - I was reading a books recently that said we can't be in full bloom all the time; sometimes we have to go into dormancy to rest up. Maybe you are in a rest period and you'll be back flowering beautifully soon. All the best. Your blanket has an interesting pattern. Yes. The name does suit. I love YA books too. Sometimes it surprises me that some books are in that section, but I guess it really means YA and upwards, which covers me! Great colours in your blanket, I have just started a new Granny Square one.I quite fancy another ripple but can not decide on the colours. We all get "the can't helpits" sometimes, I just retreat into my sewing room or a good book, I am going to look up Candace Fleming, I quite like a bit of YA myself. Love that blanket, must try that stitch. Maybe a scarf though :). I've been having issues commenting on others blogs this last wee while. Think blogger is having a dose of the doldrums'. Oh Hensfoot is gorgeous. Love it. How great to be smitten with your work! I think I'd keep going and resist setting it aside in favor of Christmas stuff. Great name, too! Sending you a virtual hug and hoping you are feeling more yourself soon. Love the blanket, such beautiful colours and a great name. 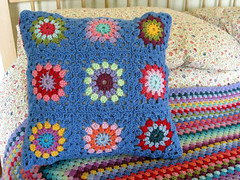 I may have said this before, but I think your blanket is just gorgeous..and I do love the colors you are using. Hope that the "blahs" will soon disappear. They happen to me as well at times. The deep, rich colours of your Hensfoot blanket are great - can't wait to see it finished ! It will be the perfect winter throw ! Hope you feel much better soon. Your blanket is amazing. Sorry the blahs have got you down, hope you are feeling better soon. Your blanket is really coming along, I love it! Like that pattern, and the colours are great too. I'm a closet YA reader too - reading one right now (Eragon). Hope you are feeling better soon. As others have said, the blanket is truly beautiful and will be a joy to use. I also am fascinated by the Romanovs and that whole era. I hope you are feeling better soon. Anxiety is such a tough thing to deal with; ask me how I know! Jennifer I think your Hensfoot is coming along beautifully. The colors you've chosen are perfect together. I sometimes like YA writing too. Sometimes I feel that it gets to the point much quicker and understandably. I hope your days become brighter very soon. Your blanket is coming along nicely ... and I love 'Hensfoot'. Sorry to hear you are feeling 'blah' hope it passes soon. 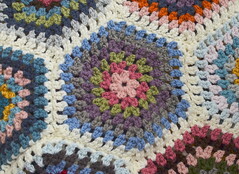 I'm loving your blanket, the colours and pattern work really well, and I love the name you've christened it. I popped Me Before You on my wishlist when you mentioned it before and I noticed it had been reduced to 99p for the Kindle the other day so I bought it, I shall start it soon, I'm looking forward to reading it. I find the Romanovs fascinating too and I think young adult books are really good at explaining things sometimes, they often talk to me in a language I understand more than some other books so I shall look out for this one. Hope you're feeling better soon. I've been feeling a bit adrift myself, and most definitely blah, so I can totally sympathise. With me I know that in part it's because I'm exhausted ... I do hope you can pack in lots of downtime doing the things you love to do, and feel better for it. The stitch in the blanket is beautiful!! Your blanket is coming on nicely and I like its new name. There was an article in the press this week about a review of the Romanov case by the Russians, prior to the centenary of the revolution in 1917 and the Tsar's family's execution in 1918. 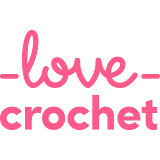 Oh how I wish I could crochet like you do! Your blanket will be amazing. I hope that by now, you are feeling a bit better.